Altered Ice Skate plus Graphic 45 CHA sneak peeks! Today is an exciting day on the G45 blog! CHA sneak peeks! Let me tell you, i have all the new collections in hand, they are AMAZING! you all are in for some real treats! Starting with Good Ol' Sport! Check out the blog! I am a lover of all things wintery, minus the temperature LOL! Growing up in TN as a kid we had lots of blizzards and with that , tons of winter activities! Ice skating was one of those that I loved! When I saw these skates at my work, I knew 12 Days of Christmas paper was perfect for them! I created a little scene in the opening at the top, filled with fussy cut images and chippies. Hope you like the tutorial and will give them a try! 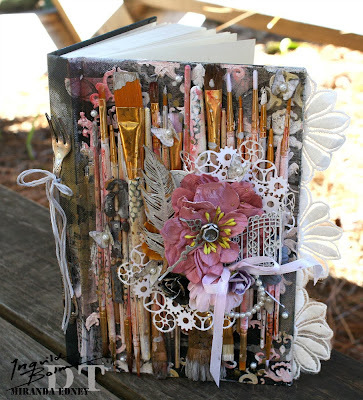 Hey everyone, sharing my art journal I created for the Ingvild Bolme / Prima blog. Each month we get the immense pleasure of being featured on the Prima blog showcasing Ingvild's amazing lines! And let me tell you, her products get better and better! I created this for a special friend :) to hopefully push her to be creative! Chck out the Prima blog for all the ladies AMAZING works! The gals are amazing! I also have a full video tutorial! For my day 11 gift idea, I made something for the one and only Charee! Featuring the star of Graphic 45, baby Richard! I always adore the photos I see of him, so I knew he would make the perfect little drummer on top of this hat/card! I have him sitting in the birds nest up top, drumstick in hand! The bottom of the hat opens up for the card. Check out the video for a overview and tutorial.